Note: This is the fourth and last part in a series on building your own home-brewed map server It is advisable to read the previous installments, found here, here and here. This is the point at which the tutorial-like flavor of this series breaks down, for a variety of reasons. From here on, we’ll be dealing with divergent variables that cannot be easily addressed. We’ll discuss them each as they come up. Suffice to say that from now on I can only detail the steps I have taken. Any steps you take will depend on your equipment and circumstances. Having finished putting my server together, I decided it was time to give it a face to show the world. Before I could do so, however, I had to give it a more substantial connection to that world, a process that began with establishing a dedicated address (domain). The most common method of achieving this is to simply purchase one (i.e., http://www.myinternetaddress.com). There are a variety of web hosts you can turn to for this. I cannot personally recommend any of them (due only to personal ignorance). For the purpose of this exercise I didn’t feel I needed a whole lot (all I really wanted was an address, since I intended to host everything myself), so I went to DynDNS and created a free account (thanks, Don). DynDNS set me up with a personal address, and the use of their updater makes it work for dynamic addresses (which most routers provide). The web site does a decent job of walking you through the process, including setting up port forwarding in your router. Exactly how to go about forwarding a port is particular to the router in question, so I won’t go into it in detail. I will say that it is not something that should be approached lightly. Port forwarding can pose certain security risks. It’s a very good idea to do some research into the process before you dabble in it. Once I had an address and a port through which to use it, I had to choose a front end for my server. I was tempted to go with Drupal, mainly because it has the best documented means with which to serve up TileStream, but also because I’ve been meaning to learn my way around Drupal for some time now. And so I decided learning Drupal could wait for another day. Instead I chose to go with WordPress, for several reasons. I’m reasonably familiar with it, it’s a solid, well-constructed application, it’s extremely customizable, and it has an enormous, dedicated user base who have written huge amounts of themes and plugins. And while WordPress was originally intended to be a blogging platform (and remains one of the best), it’s easy enough to reconfigure it for other purposes. But replace ‘mysite.com’ with the address you created at DynDNS. Back to Webmin. On the sidebar menu, click on Servers→Apache Webserver→Virtual Server. Scroll down to the bottom. Leave the Address at ‘Any’. Specify the port you configured your router to forward (should be port 80, the default for HTTP). Set the Document Root by browsing to /var/www/wordpress. Specify the Server Name as the address you created at DynDNS (the full address – include http://). Stop and start Apache for good measure. Now you should be able to point your browser to your DynDNS-created address (hereafter referred to as your address) to complete your configuration of WordPress. You will have to make many decisions. Choose wisely. Straightforward HTML. Nothing fancy, once all the machinery is in place. Which gets a little trickier for GeoServer. By design, GeoServer only runs locally (localhost). In order to send GeoServer maps out to the universe at large, we have to do so through a proxy. This has to be configured in Apache. Luckily, Webmin makes it a relatively painless process. We’ll start by enabling the proxy module in Apache. Click on Servers→Apache Webserver→Global Configuration→Configure Apache Modules. Click the checkboxes next to ‘proxy’ and ‘proxy_http’, then click on the ‘Enable Selected Modules’ button at the bottom. When you return to the Apache start page, click on ‘Apply Changes’ in the top right-hand corner. Your server will have a name other than maps. Most likely, it will be localhost. 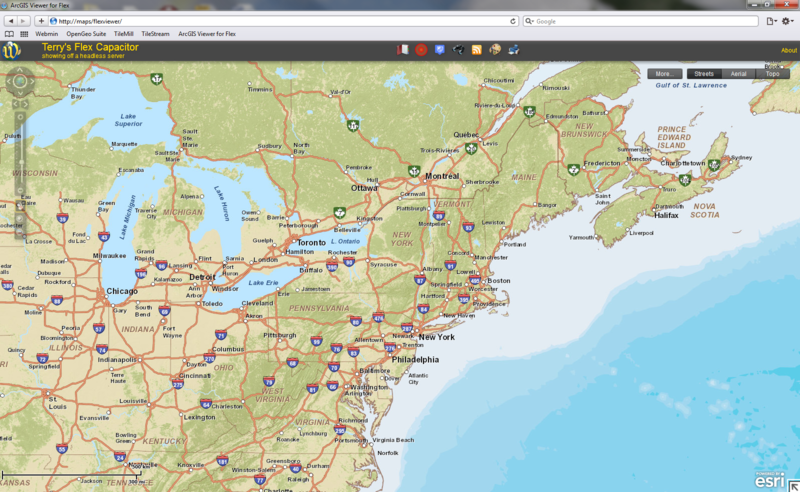 In any case, you can find it by looking in the location bar when you access the OpenGeo Suite. Apply the changes again, and you might as well stop Apache and restart it for good measure. I won’t make any promises as to how long I will keep it up and running, but it will be there for a short while, at least. Keep in mind that it is a work in progress. So be nice. Update: My apologies to anyone who may give a crap. but I have pulled the plug on the Webby Thing. It was really just a showpiece, and I just couldn’t seem to find the time to maintain it properly. And frankly, I have better uses for the server. Sorry. Note: This is the third part in a series on building your own home-brewed map server It is advisable to read the previous installments, found here and here. Last time, I walked you through installing TileMill, and I promised a similar treatment for TileStream and Flex Viewer. I am a man of my word, so here we go. Don’t worry – this will be easy in comparison to what we’ve already accomplished. We’ll start with TileStream, simply because we’re going to have to avail ourselves of the command line. Once again, you can either plug a keyboard and monitor into your server or use whatever SSH client you’ve been using thus far. And that’s that (TileStream, even more than TileMill, will throw up errors during the installation. None of them should stop the process, though, so you can safely ignore them). 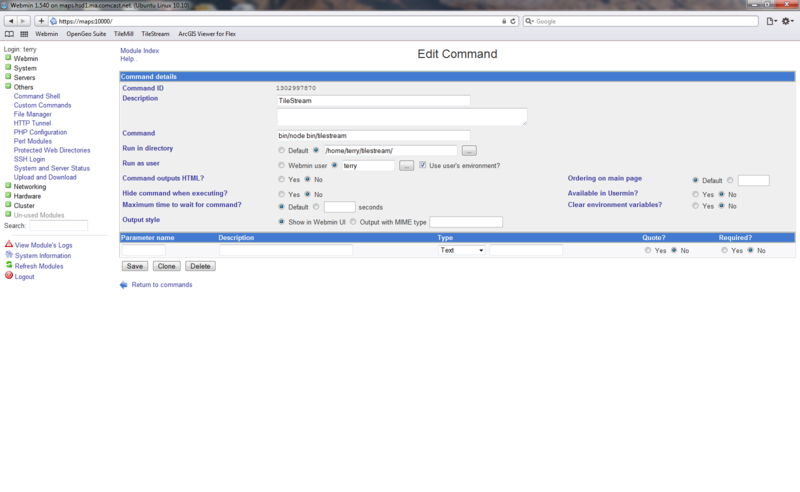 Like TileMill, TileStream needs to be started before it can be accessed in a browser. Since the plan is to run the server headless, let’s set this up in Webmin in a fashion similar the one employed for TileMill. Save it, and you will now have a Custom Command button to use for starting TileStream (we didn’t do this for TileMill because we cannot. The Webmin Custom Command function simply won’t accept it. I think it has to do with the nature of the command. I think the ‘./’ in the TileMill command confuses it). At this point, TileStream is fully functional, but it doesn’t yet have a tileset to work with. Using the same browser with which you just accessed Webmin, go here to download one. Scroll down the page, pick a tileset you like and click on it to proceed to the download page (I picked World Light). Download the file to wherever you please. Once you have the file, go back to Webmin and open the ‘Other’ menu again. Click on ‘Upload and Download’, then select the ‘Upload to Server’ tab. Click on one of the buttons labeled ‘Choose File’, then browse to the tileset file you downloaded. For ‘File or directory to upload to’, click the button and browse your way to /home/terry/tilestream/tiles (by now, you should know you’re not ‘terry’). Click the ‘Upload’ button. You can see I have customized the flex viewer. You should do so as well (it’s designed for it, after all). Open the file manager in Webmin (the ‘Other’ menu again) and navigate to /var/www/flexviwer. Select config.xml, then click the ‘Edit’ button on the toolbar. The rest is up to you. So now you have a headless Ubuntu map server up and running, and the question you are probably asking yourself is: “Do I really need all this stuff running in my server?” The answer is, of course, ‘no’. The point of this exercise was to learn a thing or two. If you’ve actually been following along and have these applications running in your own machine, you are now in a good position to poke around for a while to figure out what sort of server you’d like to run. For instance, there’s no real reason to run TileMill on a server. TileMill doesn’t serve tiles, it fires them. Therefore it’s probably not the best idea to be eating up your server’s resources with TileMill (and it seriously devours resources). The server doesn’t have a use for the tiles until they’re done being fired, at which point TileStream is the tool for the job. That said, there’s no compelling reason why you couldn’t run TileMill on your server. If you’d rather not commit another machine to the task (and if you’re not in any kind of hurry), why not give the job to the server? It’ll take it a while, but it will get the tiles fired (if your server is an older machine like mine, I would strongly advise you to fire your tiles in sections, then put them together later. I suggest firing them one zoom level at a time and combining them with SQLite Compare). 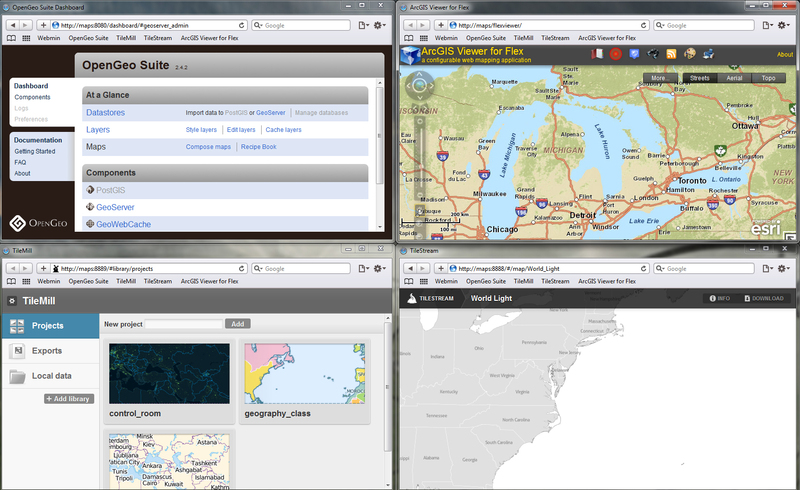 Flex Viewer and the OpenGeo Suite don’t often go together, but there’s no reason why they can’t. Flex Viewer can serve up layers delivered via WMS – there’s nothing to say GeoServer can’t provide that service. They are, however, very different applications, with vastly different capabilities, strengths and weaknesses. They also have a very different ‘feel’, and we should never discount the importance of aesthetics in the decision making process. A final – and very important – consideration in the final configuration of our home server is the nature of the face it presents to the world. In order for a server to serve, it must connect to and communicate with the world at large. This means some kind of front end, the nature of which will influence at least some of our choices. Which brings us neatly to the next post. See you there. Note: This is the second part in a series on building your own home-brewed map server (I would tell you how many installments the series will entail, but I won’t pretend to have really thought this through. There will be at least one more. Probably two). It assumes you have read the previous installment. You have been warned. Last time, I walked you through setting up your very own headless map server using only Free and Open Source Software. 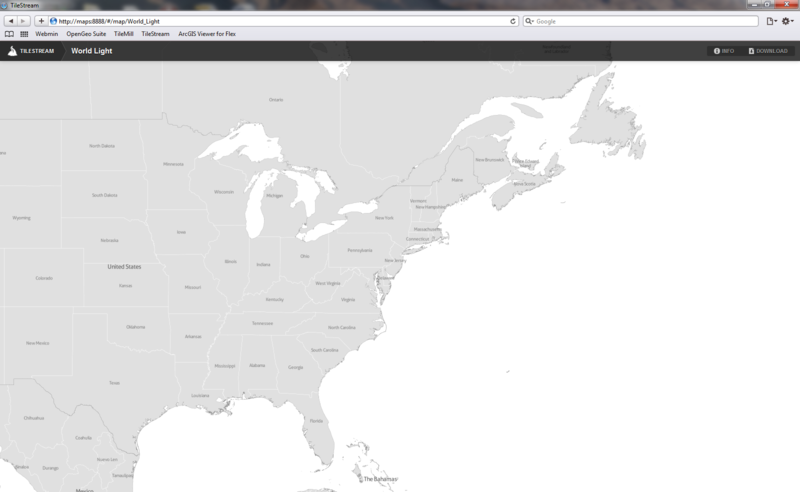 Now, I’m going to show you how to trick it out with a few extra web mapping goodies. The installation process will be easiest if you re-attach a ‘head’ to your server (i.e., a monitor and keyboard), so go ahead and do that before we begin (alternately, if you’re using PuTTY to access your headless server, you can use it for this purpose). At the end of my last post, I showed you all a screenshot of my server running TileMill, TileStream and Flex Viewer, and I made a semi-promise to write something up about it. So here we are. I tend toward a masochistic approach to most undertakings in my life, and this one will not deviate from that course. Whenever I am faced with a series of tasks that need completion, I rank them in decreasing order of difficulty and unpleasantness, and I attack them in that order. In other words, I work from the most demanding to the least troublesome. I originally intended to write a single post covering TileMill, TileStream and Flex Viewer, but a short way into this post I realized that I had to split it into two pieces. The next post will cover TileStream and Flex Viewer. This one will get you through TileMill. It’s not as scary as it looks (the color-coding is my doing, to make it easy to differentiate things). The only circumstance that makes this particular process difficult is that the author of these instructions assumes we know a thing or two about Linux and the command line. Let’s start at the top, with the first ‘paragraph’, which begins: # Mapnik dependencies. Translation: We will now proceed to install all the little tools, utilities, accessories and such-rot that Mapnik (a necessary and desirable program) needs to function (i.e., “dependencies”). It is assumed that we know the entire ‘paragraph’ is one command and that the forward-slashes (/) are not actually carriage returns and shouldn’t be followed by spaces. It is also assumed that we will notice any errors that may occur during this process, know whether we need concern ourselves with them and (if so) be capable of correcting them. Let’s see what we can do about this, shall we? Since we’re installing this on our server and actually typing in the commands (rather than copying and pasting the whole thing), we have the luxury of slicing it up into bite-sized pieces. This way the process becomes much less daunting, and it makes it easier for us to correct any errors that crop up along the way. You get the idea. Continue along in this fashion until you have installed all the necessary dependencies for Mapnik. I strongly recommend doing them all in one sitting. It just makes it easier to keep track of what has and hasn’t been installed. At this stage of the game, any errors you encounter will most likely be spelling errors. Your computer will let you know when you mistype, usually through the expedient of informing you that it couldn’t find the package you requested. When this occurs, just double-check your spelling (hitting the ‘up’ cursor key at the command prompt will cause the computer to repeat your last command. You can then use the cursors to correct the error). At certain points in the installation process, your server will inform you of disk space consumption and ask you to confirm an install (in the form of yes/no). Hitting ‘y’ will keep the process moving along. While packages install in your system, slews of code will fly by on your screen, far too fast to read or comprehend. Just watch it go by and feel your Geek Cred grow. By now you should have developed enough Dorkish confidence to have a go at # Mapnik plugin dependencies and # TileMill dependencies. Have at it. When you’re done, move on to installing Mapnik from source. Each line of this section is an individual command that should be followed by ‘enter’. The first line will throw up your first real error. Simply paying attention to your server and following the instructions it provides will fix the problem (in case you missed it, the error occurred because you haven’t installed Subversion, an application you attempted to use by typing the command ‘svn’. Easily fixed by typing sudo apt-get install subversion). You can then re-type the first line and proceed onward with the installation. When you get to the scons commands, you will learn a thing or two about patience. Wait it out. It will finish eventually. Now we should be ready to do what we came here to do: install TileMill. Unfortunately, TileMill’s installation instructions aren’t very helpful at this point for a headless installation. All they tell us is to “Download and unpack TileMill”. There’s a button further up TileMill’s installation page for the purpose of the ‘download’ part of this, but it’s not very helpful for our situation. We could use Webmin to manage this, but what the hell – let your Geek Flag fly (later on, we’ll use Webmin to install Flex Viewer, so you’ll get a chance to see the process anyway). Watch the code flash by. Enjoy the show. This package is still in beta, so it will probably throw up some errors during installation. None of them should be severe enough to interrupt the process, though. Feel free to ignore them. Once the installation is complete, we’ll have to start TileMill before we can use it. This can be achieved by typing ‘./tilemill.js’in the terminal, but TileMill actually runs in a browser (and we’ll eventually need to be able to run it in a server with no head), so let’s simplify our lives and start it through Webmin. Click the button again (after you’ve gone through this process a couple of times, Webmin will remember these commands and you’ll be able to select them from a drop-down list of previous commands). Take a short break and play around with the program a bit. You’ve earned it. When you’re done I’ll be waiting at the beginning of the next post. Fellow Map Dork and good Twitter friend Don Meltz has been writing a series of blog posts about his trials and tribulations while setting up a homebrewed map server on an old Dell Inspiron (here and here). I strongly recommend giving them a read. At the outset, Don ran his GeoSandbox on Windows XP, but recently he switched over to Ubuntu. While I applaud this decision whole-heartedly, I thought I’d take the extra step and build my own map server on a headless Ubuntu Server box (when I say ‘headless’, I am talking about an eventual goal. To set this all up, the computer in question will initially need to have a monitor and keyboard plugged into it, as well as an internet connection. When the dust settles, all that need remain is the internet connection). The following is a quick walkthrough of the process. 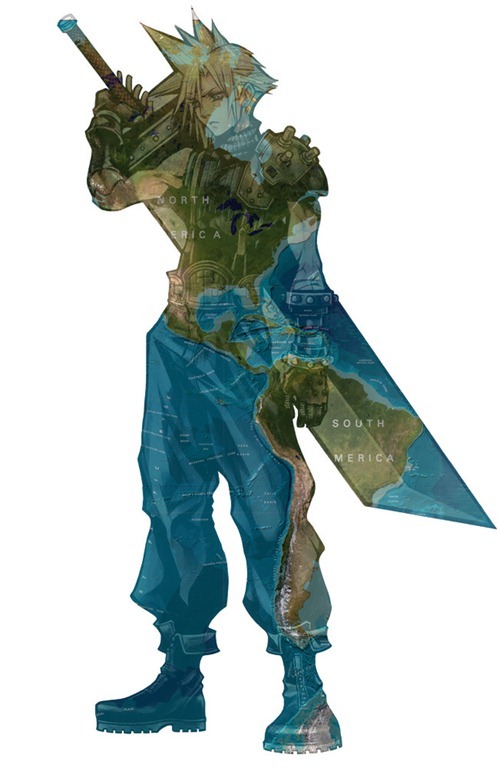 I apologize to any non-Map Dorks who may be reading this. The above image shows my choices (what the hell – install everything, right?). Definitely install Samba shares. It allows Linux machines to talk to others. Also, be sure to install the OpenSSH server. You’ll need it. For our purposes, there’s no real reason to install a print server, and installing a mail server will cause the computer to ask you a slew of configuration questions you’re probably not prepared to answer. Give it a pass. During the installation process, you will be asked to give your server a name. I named mine ‘maps’. So whenever I write ‘maps’, substitute the name you give your own machine. Once your installation is complete, you will be asked to login to your new server (using the username and password you provided during installation), after which you will be presented with a blinking white underscore (_) on a black screen. This is a command prompt, and you need not fear it. I’ll walk you through the process of using it to give yourself a better interface with which to communicate with your server. Hang tight. Let’s begin the process by taking control of the machine. Type in “sudo su” (sans quotation marks) and hit ‘enter’. The server will ask for your password, and after you supply it, you will be able to do pretty much anything you want. You are now what is sometimes called a superuser, or root. What it means is that you are now speaking to your computer in terms it cannot ignore. This circumstance should be treated with respect. At this stage, your server will erase itself if you tell it to (and it won’t ask you whether or not you’re sure about it – it’ll just go ahead and obey your orders). So double-check your typing before you hit ‘enter’. Cool, huh? Don’t get your hopes up, though. We’re not done with the command line yet (don’t sweat it – I’ll hold your hand along the way. Besides – you should learn to be comfortable with the command line). 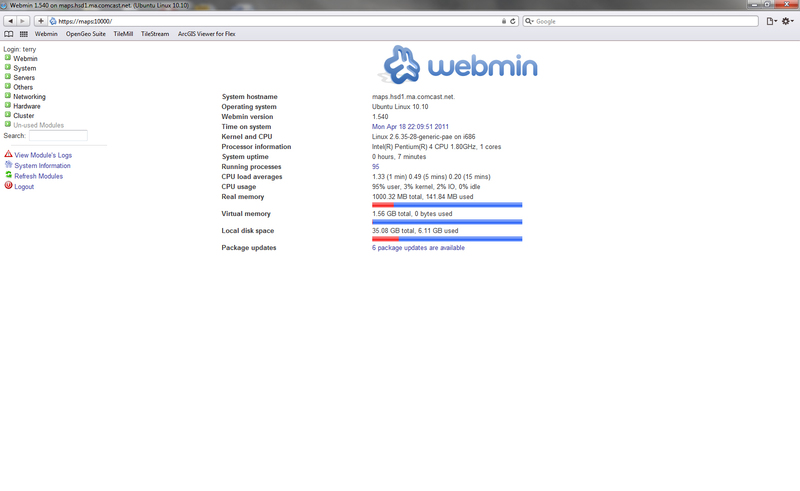 For the moment, though, let’s take a look around the Webmin interface. There is a lot this program can do, and if you can find the time and determination it would be a good idea to learn your way through it. For now, you just really need to know a few options. The first is that the initial page will notify you if any of your packages (Linux for ‘software’) have available updates. It’s a good idea to take care of them. If you want, Webmin can be told to do this automatically (on the update page you get to when you click through). The other important features are both located under the ‘Other’ menu (on the left). The first is the file manager (which bears a striking resemblance to the Windows File Manager of old), which gives you the ability to explore and modify the file system on your server (this feature runs on Java, so be sure the browser you’re using can handle it). The other feature is ‘Upload and Download’ which does what it says it does. Together, these two features give you the ability to put maps on your map server, something I assume you’ll want to do. Please note the specs on my server (as pictured above). It’s not terribly different than Don’s Inspiron. I’m not suggesting you do the same, but it is worth noting that an old machine can handle this job. Rock and roll. When your server is done doing what it needs to do, go back to the browser you used for Webmin and type http://maps:8080/dashboard/ into the location bar. 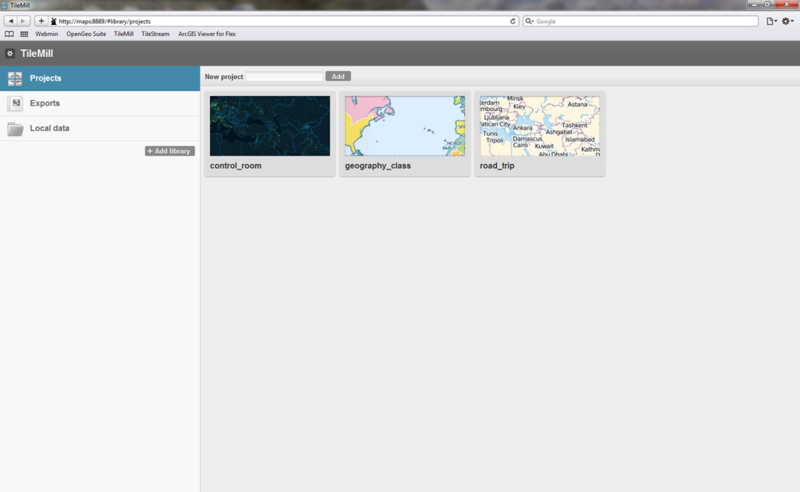 Check out the OpenGeo goodness. You’ll be asked for a password, and then you’re in (I hear this works the same in OS X, but I cannot confirm it). If you’re using a Windows machine – or if you just prefer a GUI – you can use PuTTY. PuTTY is very simple to use (and it comes as an executable. I love programs that don’t mess with the registry). Tell it the name of the computer you want to connect to and it opens a console window asking for your username and password. Tell it what it wants to know. It’s not a bad idea to install a new, dedicated browser for use with your new server. I used Safari, but only because I already use Firefox and Chrome for other purposes. Also, your network will probably give your server a dynamic IP address. This is not an issue for you, since your network can identify the machine by name. If you want to (and there are several valid reasons to do so), you can assign a static IP address to your server. To find out how to do so, just search around a bit at the extraordinary Ubuntu Forums. Update: It seem that Webmin provides an easy method to assign a static IP address to your server. Go to Networking → Network Configuration → Network Interfaces → Activated at Boot. Click on the name of your active connection, and you will then be able to assign a static IP address just by filling in boxes. And 50 bonus points to anyone who understands the image at the top of this post.